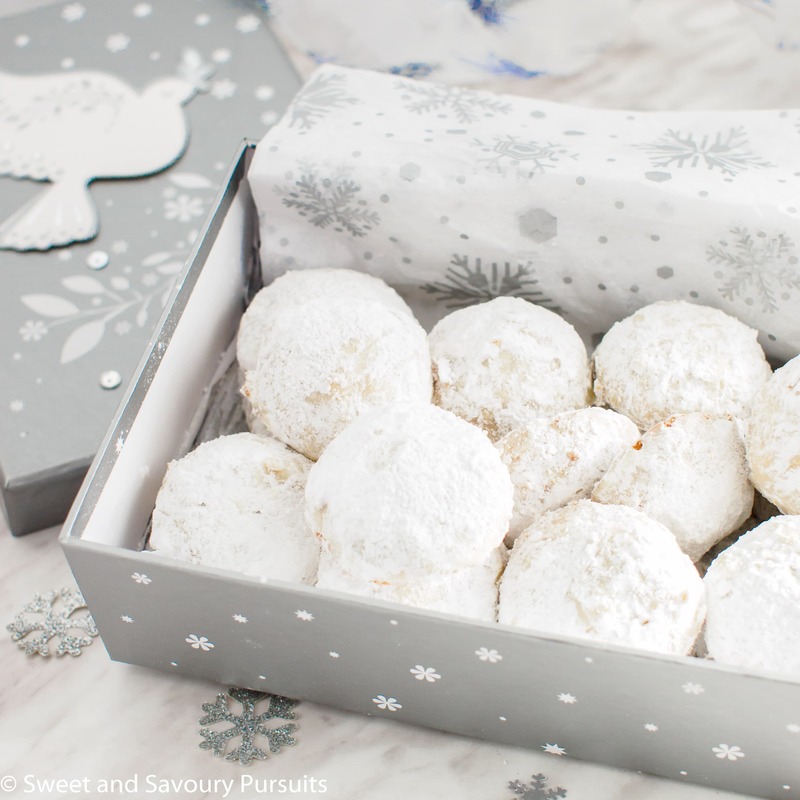 If you are planning on preparing a cookie tray for this holiday season, then you’ll want to include these Powdered Sugar Almond Cookies. 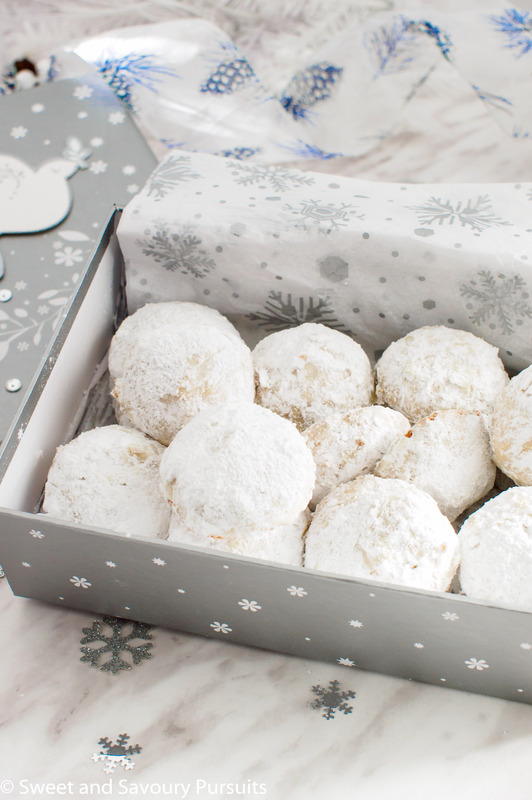 Nut cookies covered in powdered sugar are a holiday classic and are guaranteed to make your cookie tray look festive! These Powdered Sugar Almond Cookies are made with ground and toasted almonds. They’re a classic and delicate cookie, and though they’re covered in icing sugar, they’re not overly sweet. You can often find a variation of these cookies served during the holidays. This Powdered Sugar Almond Cookie recipe is so easy to make and with so few ingredients you couldn’t ask for better. This cookie is found in many parts of the world with different names and made with different nuts. If you don’t have any almonds on hand, feel free to use walnuts or pecans in their place. These cookies freeze really well, just store them in an airtight container with wax paper in between the layers of cookies. Remove them from the freezer a few hours before serving. Right before plating them sift a little more powdered sugar on them to get them looking nice and snowy! These Powdered Sugar Almond Cookies are made with ground and toasted almonds. They're a delicate, not overly sweet classic cookie often served during the holidays. In a medium bowl, combine the ground almonds, flour and finely chopped almonds. Set aside. In the bowl of your stand mixer, fitted with the paddle attachment, beat the butter and 1/2 cup of the icing sugar until well blended and fluffy. With the mixer on low speed, add the ground almond mixture and almond extract. Mix until well combined, scraping the sides of the bowl a couple of times. Using a cookie scoop, scoop out balls of dough. Shape each cookie by rolling the dough between your hands. Arrange cookies 1 inch apart onto lined baking sheets. Bake cookies, one sheet at a time, for about 14-16 minutes or until bottoms are golden and tops are slightly coloured and firm to the touch. Let the cookies cool on the sheet for about 5 minutes and then roll each one into the sifted icing sugar. Let the cookies cool completely and roll them in the icing sugar a second time. *To toast almonds, preheat oven to 325°F. Spread almonds on a cookie sheet in a single layer. Make sure to stir every few minutes. Almonds are toasted when they are fragrant and lightly browned, it should take between 8 to 10 minutes. Beautiful snowy, Christmassy photos !! Thank you Deborah! Hope you have a Merry Christmas! Fida, congratulations on a beautiful post! Gorgeous photography, the soft greys and white, with a hint of blue – winter cookies! And they look delicious. Well done! Thanks so much Louise, I really appreciate your comment 🙂 Merry Christmas! Yum! So pretty and I’m sure they taste as wonderful as they look! I loooove those, but never baked them before!! I am saving the recipe and I will try for sure 😀 thank you for sharing such an easy recipe!! I will 😀 thank you!